Carriageworks today announced a diverse contemporary program of music, food and cultural events across three weeks in June 2017 in partnership with Vivid Sydney, headlined by trailblazing UK electronic dance outfit, Goldfrapp. Vivid Sydney at Carriageworks will also herald the return of Fuzzy’s legendary Curve Ball; a specially curated Night Market; and a series of bespoke dining experiences led by Sydney’s most talented chefs and creatives, Sydney Table. This is the fourth year of a highly successful partnership with Vivid Sydney, the world’s largest festival of light, music and ideas. Goldfrapp will perform exclusively at Carriageworks on Friday 2 June to coincide with the global release of their highly anticipated new album, Silver Eye. Exclusive to Vivid Sydney in Australia this concert will be the legendary duo’s first appearance in Sydney since 2010, and their only Australian performance as part of a worldwide tour. Internationally renowned for their electric live shows, Alison Goldfrapp (vocals) and Will Gregory (synthesizer) will be joined on stage by a full live band performing tracks from soon-to-be-released Silver Eye and their full repertoire of Grammy-nominated hits. Following its launch in 2016, Sydney Table returns over four nights from 14-17 June with a series of bespoke dining experiences, formulated through pairings of Sydney’s leading chefs with cutting edge talent in the fields of music, art and design. Guests will have the opportunity to hear from creative leaders first hand while engaging with chefs up close. All produce will be sourced from NSW. This year, Sydney Table will be staged at The Clothing Store – a temporary creative space that has been established in partnership with UrbanGrowth NSW. Carriageworks will also present the second installment of The Night Market. Showcasing the best producers and chefs from across Sydney and NSW, The Night Market is a large-scale immersive experience, where visitors will encounter sensational chefs, foods stalls and produce. Curated by Fuzzy, the legendary team responsible for Field Day, Harbourlife and Listen Out, Curve Ball returns to Carriageworks as part of Vivid Sydney with another immersive musical and visual experience: Curve Ball submerged. 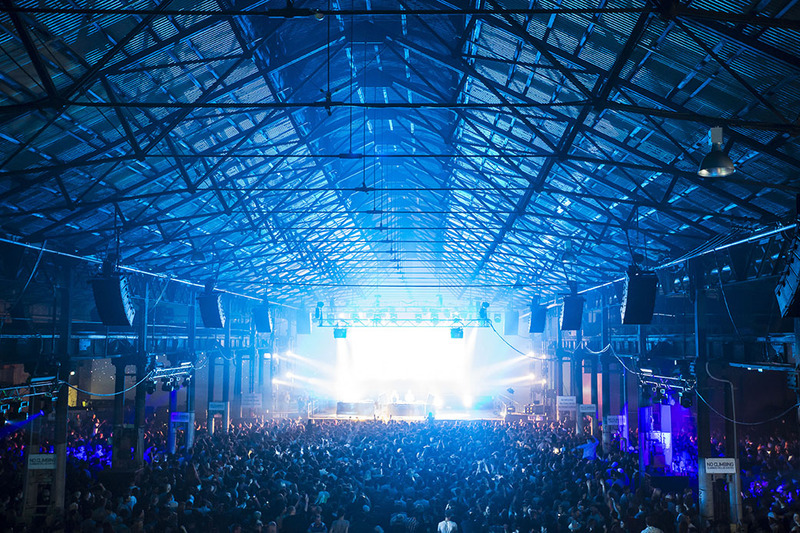 Curve Ball stood out last year as a unique experience uniting great music with stunning visuals, set against the spectacular backdrop of Carriageworks. Artists like Zhu, Cosmo’s Midnight, Basenji and many more entertained a capacity audience. The Vivid Sydney 2017 announcement sees the continued expansion of an artistic program that is infused with energy and ambition. Carriageworks has undergone unparalleled growth over the past five years, welcoming more than 1 million visitors in 2016. The 2017 Artistic Program brings together a risk-taking, culturally diverse line-up of more than 53 projects, spanning visual arts, dance, performance, film, talks and music, supporting over 800 artists.